After the killings of three agents from Mi6, Bond is sent to New York. The murders are linked to Kananga, Prime minister of an Island in the Caribbean, San Monique, who is currently visiting the United Nations. After arriving with Pan Am, CIA agent Charlie picks up Bond at the J.F.K airport. 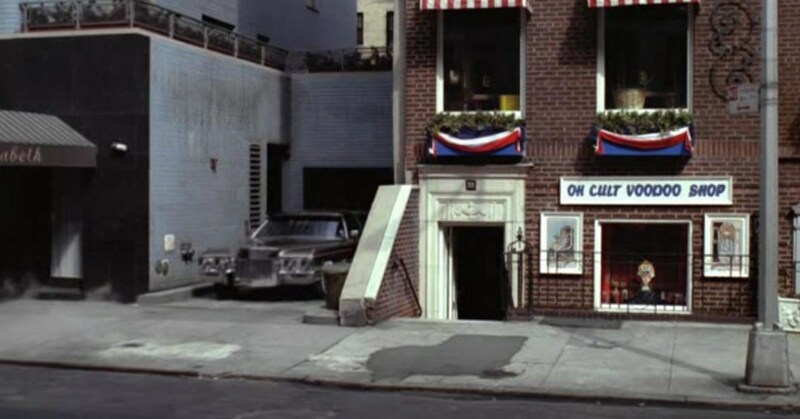 They're driving along Franklin D. Roosevelt drive when Whisper comes along in his Cadillac 'pimpmobile' and assassinates Charlie. The trail leads to the Oh Cult Voodoo shop. Felix Leiter informs Bond from his office that the Cadillac is registered to a shop on 33 east 65th street. 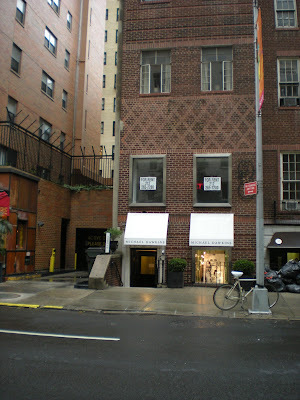 This address is actually correct and here, on the upper east side, you can still find the building. 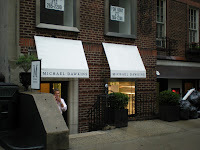 Today the ground floor houses 'Michael Dawkins', an exclusive boutique that sells hand crafted jewelry. Times have changed since 1973 and the Upper East Side is now one of the most expensive areas in Manhattan but the building and garage door from which Bond comes out is still very recognizable. The owner was outside smoking and he asked why I was taking pictures of his shop. Apparently he was not aware of the part his shop played in the film some 35 years ago, and I was happy to enlighten him. We also get a brief glimpse of the CIA office, from where Leiter and his people are watching Kananga's San Monique embassy. The building which is zoomed in on has been demolished and replaced with a skyscraper and the location is recognizeable only through the building in front of it. 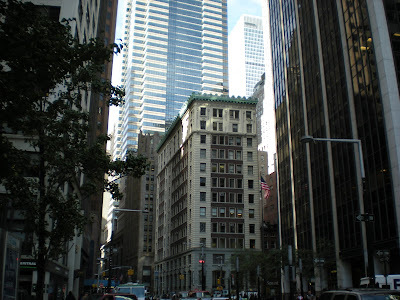 The view can be found on South street looking into Wall street. 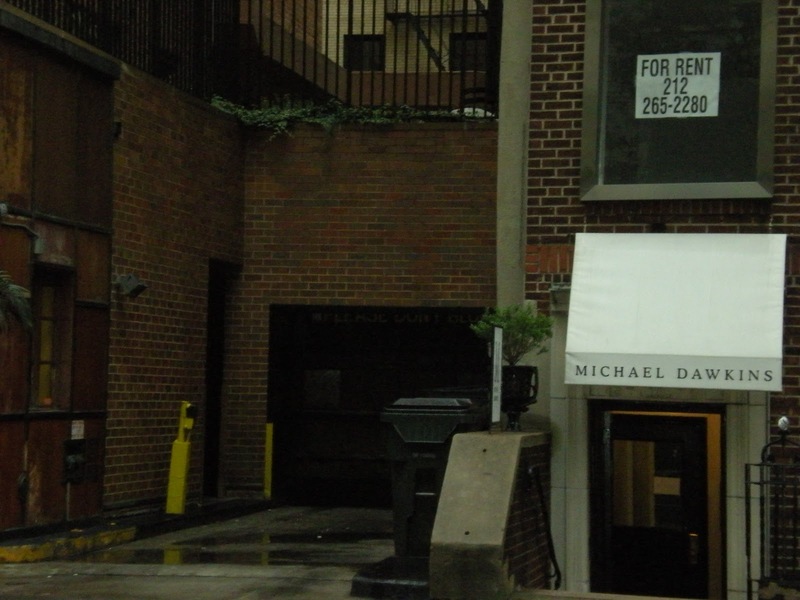 When Leiter informs Bond about the shop on 65th street he also says 'it's only a block away from here'. This is not true however, because this view is found on the southern part of Manhattan. A factual error made by the film makers. The same view and narrow building is also briefly visible in the Pierce Brosnan movie 'The Thomas Crown affair' when Brosnan is walking to his office after a quick visit at the Metropolitan Museum. 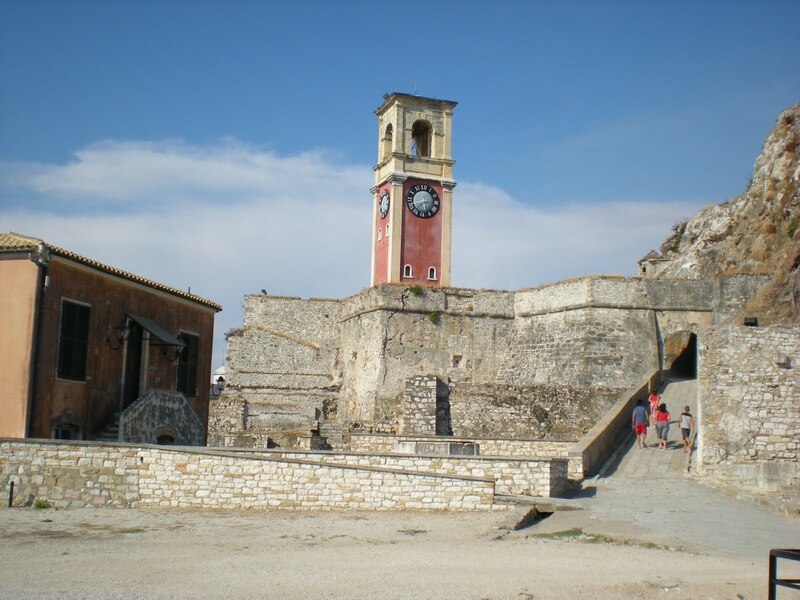 In Casino Royale, Bond takes Vesper and the Aston Martin to a small village in Montenegro to meet with Mathis, Mi6's contact there. These scenes were actually filmed in the small village of Loket, only 15 min from Karlovy Vary, in the western part of the Czech Republic. Loket is probably one of the best kept secrets of the Czech Republic, and because of that, the number of tourists are few in numbers, off season. The town centre itself features Loket Castle (Hrad Loket), a 12th century gothic castle which is one of the oldest and most valuable historical stone castles in the country. The village is surrounded by the Ohře river on three sides with only a bridge and a small piece of land connecting the village with the mainland. The town centre is a national monument and is preserved from modern developments. Unfortunately the town square is a parking lot, and the cafés and bars featured in the film were built for the movie, exept for the small wooden terrace outside of Hotel Goethe (to the left). Here you can still have a Czech beer or a coffee while enjoying this legendary location. However, don't expect them to keep Bollinger in their wine cellars. If you want to stay in Loket, there are two hotels featured in the film: Hotel Goethe and Bílý Kun opposite. Both of these hotels offer a nice view over the centre square, and you should definitely request it when booking. The yellow building visble behind Bond and Vesper is Hotel Goethe, although with montenegrin letters. 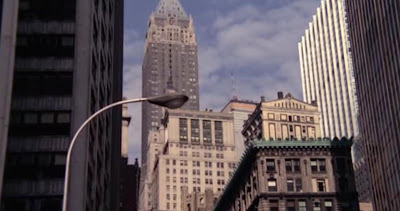 The only building with the Czech name still unchanged is Hotel Bílý Kun, visible behind Mathis in the last scene. 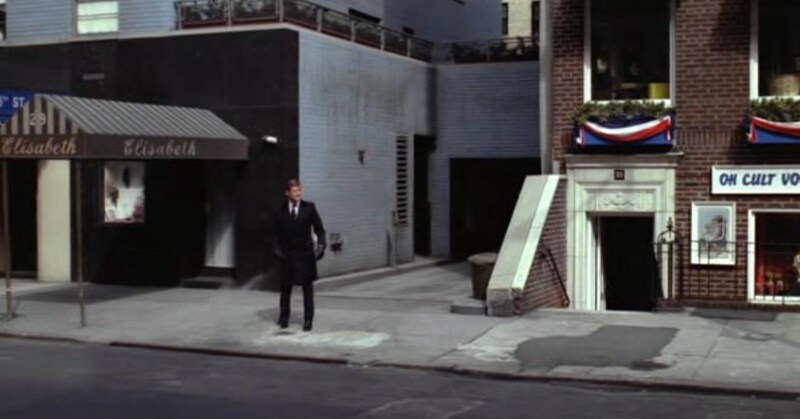 Bond is parking his Aston to the left of Hotel Goethe, and the church is briefly visible in the background. Parking is free if you're staying at a hotel. Loket castle is also a museum and from here you have a good look over the town square and the surroundings. It's well worth a visit, and it also houses a small, cosy restaurant. The best time to visit Loket is probably during early summer. March-april is still a bit cold and the trees are not yet green. Loket has beautiful surroundings and when you're driving down the road towards the village, with the tracks from Casino Royale in the car, you will agree that this is truly a spectacular location. Occasionally I will cover not only James Bond locations but also how Bond gets there. 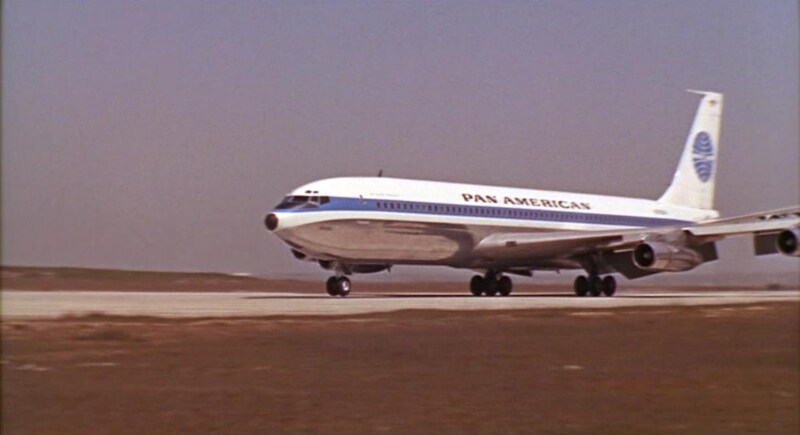 Numerous airlines have featured in the films and first out on the James Bond travel section, in honour of the new TV-series Pan Am, is suitably Pan American Airways, Bond's choice of airline in four films, including the first two. Bond's very first assignment in Dr. No, takes him to Jamaica to investigate the disappearance of Mi6 operative Strangways. 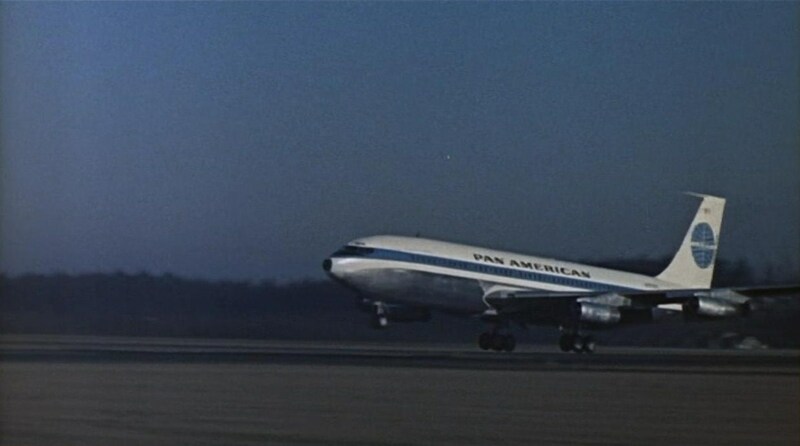 He travels there from New York on a Boeing 707-320 from Pan American. The tail number is not visible but the flight number mentioned is PA 323. Pan Am was founded by Juan Terry Trippe in 1927 and is today famous for its exclusive luxury and charm. In this case famous means famous. During the 50's Pan Am was second, after Coca Cola, in name recognition. The airline was a cultural icon of the 20th century and shaped the international airline industry and was well regarded for its modern fleet and experienced and professional crews. Pan Am's onboard service and cuisine, inspired by Maxim's de Paris, were delivered "with a personal flair that has rarely been equaled." Jamaica achieved full independence from the United Kingdom in August 1962 and was still a British colony when filming begun in January. So why Mi6 didn't use a British airline like BOAC for their agents traveling within the empire is unknown but in one of the novels Bond tells Monepenny to "schedule his flight with Pan Am as always" and it is likely that this had a significant impact on the producers. In the novel 'Dr No', Bond flies a Super Constellation. A year later, when Bond traveled to Istanbul, Pan Am was again Mi6's choice of airline. Moneypenny hands over Bond's air ticket in the office. 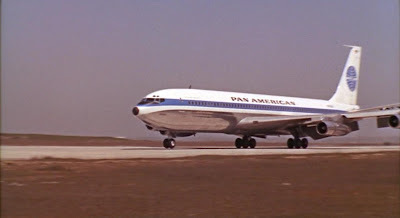 The tail number on Bond's plane is N762PA and the flight number mentioned in the film is PA1, which was actually a real flight number used by Pan Am. 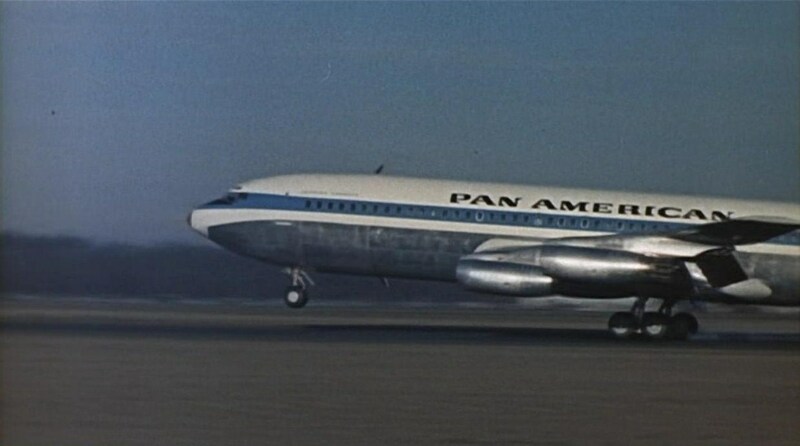 The aircraft Bond is arriving on is a brand new Boeing 707-320B, delivered to Pan Am on the 4th of December 1962. It was given the name: Clipper Endeavour, and remained in active duty with Pan Am until 1976. In the novel Bond is flying to Istanbul with BEA, British European Airways, an airline that merged with BOAC to form British Airways in 1974. 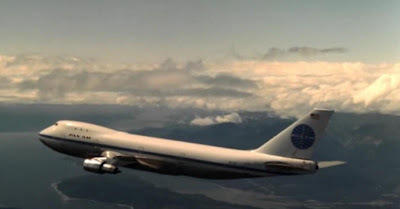 In 1973 when traveling to New York, Bond flies Pan Am's brand new Boeing 747. When Boeing launched the development programme of the 747 it was a unique innovation, that would never have seen daylight without Pan Am. The 747 was in fact a custom made aircraft developed to meet the demands of Pan Am. The tail number is N747PA. 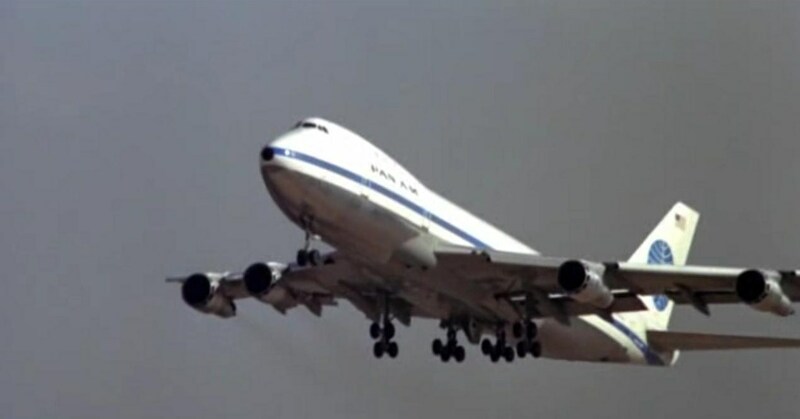 It was the second 747 made and actually the very first jumbo jet ever delivered and used for commercial flights. The first 747 was never used for other purposes than flight-tests at the Boeing plant. The aircraft was delivered to Pan Am on the third of October 1970 and was named Clipper Juan T. Trippe. It served as the Pan Am fleet flagship for many years, until the aircraft was sold to several new owners before marking the end of its career, as well as an era, serving as an on-ground restaurant in South Korea. Bond is arriving at the Pan Am Worldport at JFK airport in New York, once the centre of the airline's New York operations. This terminal is still in use today, serving as the Delta Airlines terminal, named Delta Flight Center. In 1989 Bond is on leave in Florida as the best man at Felix's wedding. The next morning he is about to fly to Istanbul on a mission. He arrives at the Key West International Airport on South Roosevelt Boulevard in Florida. Bond is checking in First Class but runs away from his ticket and bags when he learns that Sanchez has escaped. 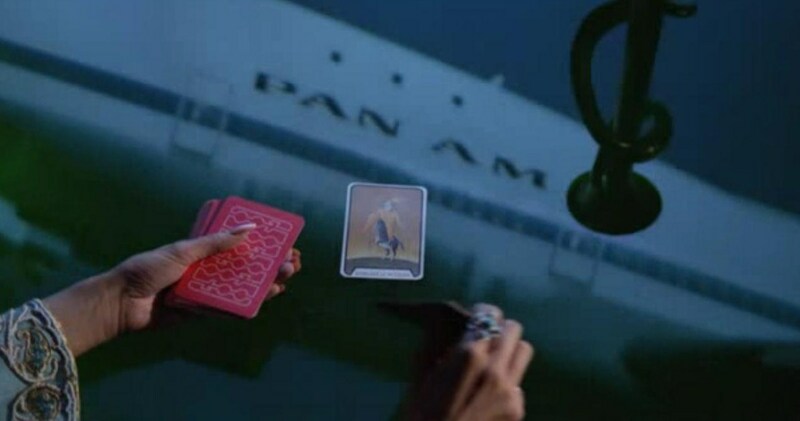 Licence to Kill was the last time Pan Am featured in a Bond film and marks the end of an era, even though only the logo was seen. The airline ceased operations in December 1991. An interesting note is that the woman at the check-in counter asks Bond if he wants smoking or non-smoking since smoking was still allowed on board in 1989. In the late 80’s Pan Am was an airline with financial troubles, although not unique nor unconquerable. That all changed overnight with the terror attack against Pan Am 103 over Lockerbie in Scotland. Pan Am 103 was a daily flight between London and New York departing on the evening of December 21, 1988. Half an hour into the flight a bomb detonated and killing the 259 passengers and crew aboard the flight as well as eleven people on the ground. 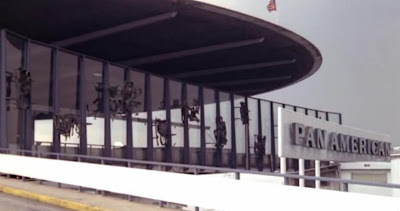 After the attack Pan Am lost many passengers and the airline eventually became unable to pay employee wages and soon had to sell what they had. Most of the airline was sold to Delta but some routes were sold to United Airlines and American Airlines. Thanks to D. Kolm for valuble information. After Loque has blown up the warehouse in 'Albania', Bond starts chasing him on foot. The entire chase and finale was filmed at the Old fortress in Corfu, covered earlier. Here the filmmakers very cleverly used various angles and spots to give the chase continuity when it's actually filmed on several different locations around the fortress. Immediately to the left when you walk into the area, past the British barracks you see the clock tower. The road to the left leads up to the tunnels that were used during the chase and it's in one of these tunnels that Loque is about to run over Bond with his Mercedes (driving in from the other side). The tunnel is very narrow and it's hard to see how they could fit the Mercedes into it. Walking thru this tunnel you eventually get out the same place where Loque is driving in. 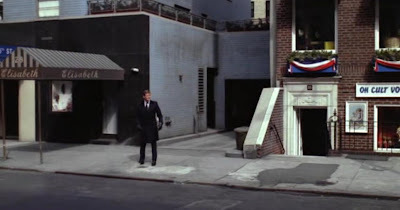 The stone stairs used by Bond can also be found here, right behind the white barracks that is seen above 'the warehouse' from the northen side. 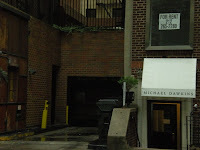 This white building has been removed in the movie as you can see below. The stairs are found close to the tunnel and just above the Warehouse, but the place where Bond is coming out was filmed at a different place of the fortress. The chase later ends at the very eastern part. Here you can find the stone gate where Bond finally shoots Loque and the cliff where he avenges Ferrara by kicking Loque's car over the cliff. This magnificent location will be covered later.